How to cook Crispy Skin Salmon Cha Soba with Yuzu Sauce? I love this dish to bits because it is easy to prepare and filled with so much goodness. 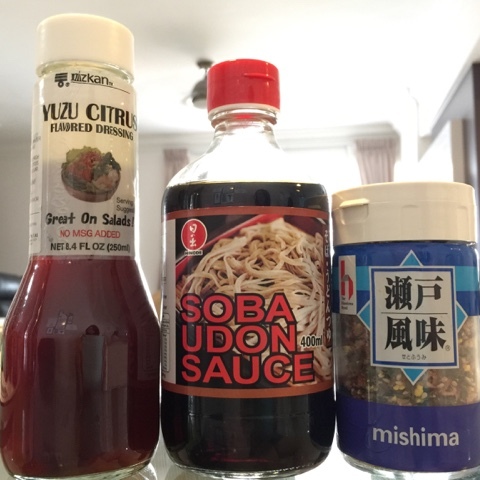 Want to know how to cook Cha Soba that resembles cold soba in restaurants? Cha Soba is noodles made from green tea powder and buckwheat. It contains powerful antioxidants to fight free radicals which are responsible for many diseases. 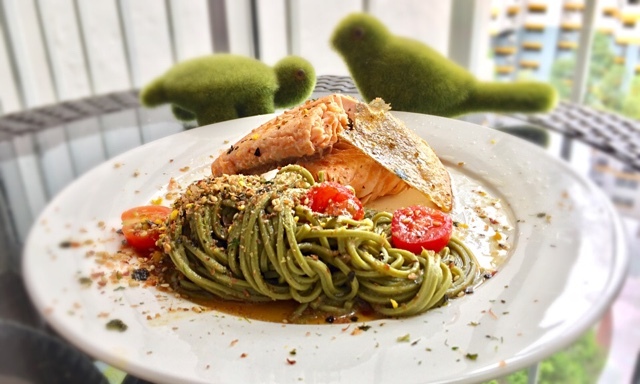 Salmon, rich in Omega 3, also has antioxidants, to lower free radicals. Remember I shared with you that I have recently taken up Yoga? Amazingly, after a few classes, my body craves for healthy food unlike swimming, I would crave for KFC. I wanted to eat a similar Salmon Cha Soba dish from Wheat Baumkuchen but it is a distance from my home. I decided to head to NTUC Finest to purchase my ingredients and cook my own version! 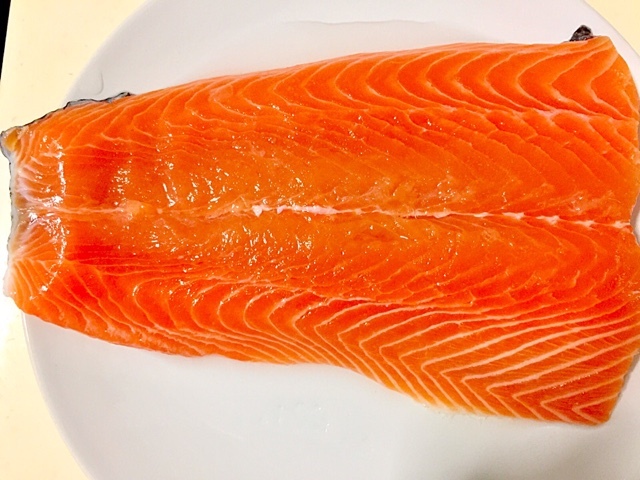 I mentioned in my previous post to purchase this type of salmon that is flat and almost triangular shaped because it is easier to gauge the cooking time for amateur cooks and there are no bones, as compared to the other one shaped like a wave. How to cook Cha Soba? Have you ever tasted terrible soba that is soft and mushy? The key in ensuring that they are not mushy is the temperature of water. Before I cooked my Soba, I prepared a large bowl of ICE cold water. I put ice into a bowl of water and left it in the freezer while I cooked my Soba. First, I boiled tap water until it was bubbling and I dropped my Soba in the pot. I also added salt. I add salt to the water whenever I am cooking pasta so I assume it is the same haha. I cooked the Soba for around 7 minutes. You must gauge your own cooking time. For me, around 7 minutes, the noodles were cooked but not mushy. You will feel that the texture is still soft and not quite like restaurant quality but after the next step, the texture changes. I drained the noodles of excess water and dumped them immediately into the ice cold water. I then placed the entire bowl in the freezer of chiller while I cooked my salmon. How to cook Crispy Skin Salmon? Ever wonder why your salmon skin is soft and leathery? The key to crispy skin lies in the high heat of the oil. Since high heat is involved, I had to make sure that my salmon has been patted dry with a kitchen towel. I also rubbed some salt on it. I put sufficient oil, slightly less than 1 cm height of the pan and turned the stove to the maximum heat. Once the pan was very hot, I placed the salmon, skin facing the non-stick pan, and watched it sizzle. There would be some drama of a small amount of oil splattering if the fish was not dry. Do not panic. It is normal. Again, gauge your own cooking time because every salmon is different. Perfectly cooked salmon tastes wonderful. Around four minutes later, I flipped the salmon over and turned the stove to low heat, so that the flesh would not be overcooked easily. Around 4 minutes later (seriously depending on the thickness of your salmon), it was ready with soft and juicy salmon flesh. The skin was also deliciously crispy, giving the Cha Soba a crunchy texture. How to season the dish? Seasoning is the success criteria of this dish. Have you ever heard your bosses saying success criteria? It was time to take the Cha Soba from the fridge. I drained the excess water and added a teaspoon of Yuzu Citrus dressing, 3 teaspoons of Soba Sauce, 2 teaspoons of soya sauce. Adjust the number of teaspoons according to your preference. I like strong flavours. I tasted and adjusted with another half a teaspoon here and there. For seasoning, don't be afraid to taste and adjust according to your family preferences. I tossed the noodles thoroughly and used a pair of chopsticks to twill them and got ready to plate up. For the salmon, a small amount of salt and lemon juice were sufficient because the star of the dish is the Cha Soba. I would not want any other flavours to overpower the noodles. Lastly, once the salmon and Cha Soba have been plated, I sprinkled Bonito, sesame seeds, ground flaxseed to give the dish a crunchy texture. 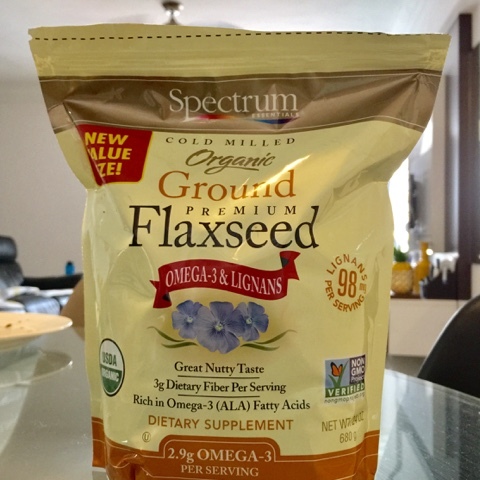 Flaxseeds is famous for their health benefits, high in antioxidants, promotes healthy weight loss, skin and hair. I purchased mine from Brown Rice Paradise supermarket at Tanglin Mall. I also tossed in my cherry tomatoes which have lycopene-a type of antioxidant. I enjoyed the sensation of eating hot Salmon with cold Soba and it felt good, knowing it is not exactly junk food. Hope you enjoy my cooking journey! Leave your comments to share your soba recipes!